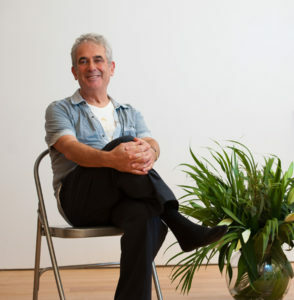 Malcolm Stern is a psychotherapist and author. He’s also co-director and co-founder of Alternatives at St James’ Church in London, which has served as a platform for global spiritual speakers and alternative thinking for over 30 years. Malcolm did the Process in 2003. Q: Malcolm, you’ve spoken at many events on the subject of bereavement and mental health since your daughter Melissa took her own life in 2014, aged only 33. Why is that? 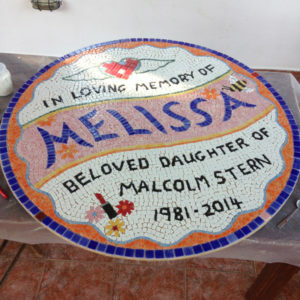 Finding platforms where I can speak about what happened – such as the Compassionate Mental Health conference – helps me, and is part of giving Melissa’s death meaning. Sometimes when I speak about it I can be quite matter-of-fact, and at other times the emotions can hit me. Either way, it gives permission to those in the room to talk more freely and deeply about their own experiences. Q: How has losing Melissa changed you? I know that since Melissa‘s death, I‘ve been able to go to deeper places as a therapist. By fully embracing my grief, I find I experience all feelings more profoundly. I’m definitely less philosophical and more real. Q: As a society, we can find it difficult to discuss death – why do you think that is? I think there are two reasons. Firstly, we’re scared of facing our own mortality. In ancient cultures, we saw death as a natural part of the life cycle. We revered our elders as people who had been through loss and who had the wisdom to help us understand such rites of passage. These days, we live in a largely de-natured society that worships youth and beauty. The more we lose touch with nature’s natural rhythms, the more we tend to disengage from the reality of death. The second reason is that, depending on how life ends, the final phase often means coming to terms with your own vulnerability. It can open you up and ask you to admit to your own needs and suffering in a society that admires self-sufficiency and the ‘stiff upper lip’. Sometimes we can be more afraid of feeling exposed, needy and becoming a burden than of actually dying. 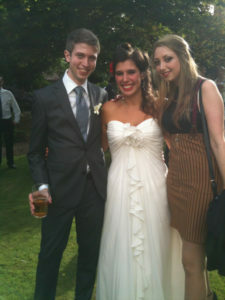 Melissa at her wedding in 2013 with her siblings Alix and Michael. Q: While grieving is never easy, why do some people find it easier to journey through grief than others? I think it depends how in touch you are with your feelings and how genuine you’re already able to be in your relationships. For some people, it’s the first time that they’ve been that raw, and many people don’t know how to handle that, either in themselves or in those they love. I‘ve experienced many mourning scenarios, for example, where people try to divert the mourners from their grief, to cheer them up rather than hold a space for them to express it. Q: Your elderly father died in 2011 and Melissa in 2014. Did you find that people treated you differently in such contrasting circumstances? Yes, the difference is subtle but nonetheless there. It changes who you can be around. My father’s death was expected and he’d had a long life. Melissa’s death took me into such raw feelings that not everyone could be with me in that space. I worked in hospices in the 80s and I noticed that same thing happens when people are dying; they intuitively know who they can be around. Not everyone can be in that space of vulnerability. It doesn’t mean that you have to express it or discuss it – just being there without requiring that the person puts up a front to protect you from their experience is a real gift. Q: Do you feel that you ever finish grieving? Yes and no. To an extent, I wouldn’t want it to come to an end. I welcome the ebb and flow of strong feelings; it’s part of feeling alive. I’d say that the grief transmutes and expresses itself in different ways over time. Certainly there are shifts that happen in your relationship with the person who has passed. Q: We find that there can be a challenge around grief for people coming on the Hoffman Process when it comes to considering our relationships with parents. Many people find it hard to see their parents ‘warts and all’ in any case, but especially if they have passed on. There’s often a phase of grief when we glorify the person and see them through rose-tinted glasses, but we also have to be prepared to look at the reality of a relationship to be able to understand and heal it. We can’t do that if they’re on a pedestal. The Process is very skilled at helping people with that reframing. Q: Do we have unrealistic expectations around grief? In her seminal book On Death and Dying, Elizabeth Kübler-Ross said it takes about two years to come to terms with a loss. The first 6 months are spent actively mourning, and for the next 18 months we’re in recovery. Although each death is unique and doesn’t follow a timetable, that does at least give people permission to take time for an emotional process in a culture which often expects us to rush through or ignore our feelings. Q: How does the Hoffman Process fit into this? I think people are drawn to the Process when they’re ready to go to deeper places emotionally. Often they find places where they haven’t fully grieved or even grieved at all. The Process normalises intense emotions, and the seven-day residential nature of it allows you explore them very deeply in a safe space. 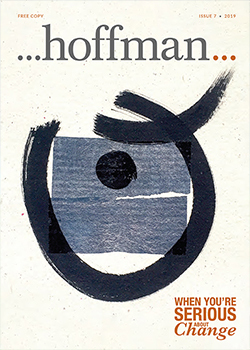 When you’ve experienced something like Hoffman, there’s a sense of recognising others who have been on the same journey and been through the same rite of passage. It can allow for much bigger, far more ‘real’ conversations and relationships. Q: People sometimes feel that it’s self-indulgent to spend a week and a considerable sum of money on themselves. What are your thoughts on that? Once you do the Process, you become more self-aware and more emotionally resourced. That means you go back into your life a more useful member of society. We need more people with the kind of emotional resilience that you gain on the Process. After all, the suffering isn’t going to get less as we grow older. I see it in the speakers we have at Alternatives – those who have suffered a great deal are often those who have the greatest impact and the most to share. All great artists have known great suffering; it’s what moulds us and tempers our souls. We’re not talking about avoiding suffering, we’re talking about having broader shoulders – and the Process can certainly help with that. More than a decade after doing Hoffman, I still consider it one of the most transformational journeys I have undertaken. It has integrity, wisdom and community at its heart. Q: Do you have any suggestions for those of us who need to grieve? Use your voice in the grieving process. Speak your feelings out loud – even if it isn’t possible to read a eulogy at a formal service, create your own way to speak aloud your feelings. After Melissa’s death, my cousin taught me the Kaddish from our Jewish tradition. I spoke this particular prayer every morning and evening for 11 months, and in the final month God speaks it. It helped to give a framework and focus to my grief. Some people find solace in creating a wider meaning out of loss. They may plant a tree or a garden, write a book, volunteer or fundraise for a cause. For example Marian Partington, whose sister Lucy was one of Fred West’s victims, spoke at Alternatives about setting up the Forgiveness Project, because forgiveness allowed her to find a positive relationship with her own suffering, which can be beneficial to others. Resource yourself with people who are comfortable with deep emotional states. That might be a formal support group or friends who can be there for you without expectations or trying to fix things. If you’ve done the Process, there’s a whole community of people you can reach out to.